Shaping Work-Life Culture in Higher Education provides strategies to implement beneficial work-life policies in colleges and universities. As compared to the corporate sector, higher education institutions have been slow to implement policies aimed at fostering diversity and a healthy work-life balance, which can result in lower morale, job satisfaction, and productivity, and causes poor recruitment and retention. Based on extensive research, this book argues that an effective organizational culture is one in which managers and supervisors recognize that professional and personal lives are not mutually exclusive. With concrete guidelines, recommendations, techniques, and additional resources throughout, this book outlines best practices for creating a beneficial work-life culture on campus, and documents cases of supportive department chairs and administrators. A necessary guide for higher education leaders, this book will inform administrators about how they can foster positive work-life cultures in their departments and institutions. "Creating a supportive work-life culture is part of the new competitive landscape of attracting top talent in higher education. Dual career couples and working parents are just two of the reasons why senior leadership must pay attention to building supportive organizational cultures if they wish to recruit and retain faculty and staff. Bryan and Wilson provide clear road maps and valuable resources for creating new structures that allow faculty, staff, and students to be productive and successful." 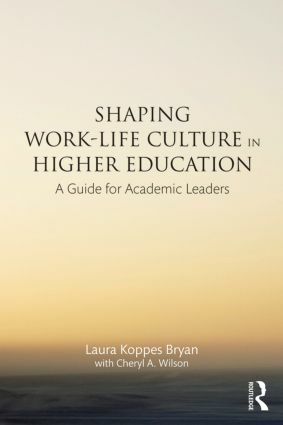 "Shaping Work-Life Culture in Higher Education is an excellent, readable account of what you need to know about work-life to be an effective leader in an institution of higher education. Not only does it provide a compilation of the research to date plus a complete list of resources; the authors have also developed a practical, step-by-step guide for both academic and non-academic leaders." Dr. Laura Koppes Bryan is Dean of the Yale Gordon College of Arts and Sciences and Professor of Psychology at the University of Baltimore. She is a U.S. Fulbright Scholar and a Fellow of the American Psychological Association, the Association for Psychological Science, and the Society for Industrial and Organizational Psychology.